It’s that time of the year again: while the rest of Europe is having a hard time with rain, snow and cold temperatures, the Canary Islands are blossoming and entering Spring time and you can already feel the excitement for summer. Everywhere on the islands you will find fresh green leaves and stunning colourful flowers at this time of the year. It’s the perfect moment for exciting hikes in the beautiful natural parks of the islands, enjoying the warm weather on the beach and generally just enjoying the fresh feel of Spring time. So, where is the best place to enjoy Spring on the Canary Islands? We have selected three new houses that are very different, but also have something crucial in common: the three of them offer stunning views so that you can enjoy the beautiful Spring landscape with all your senses. Es ist wieder soweit: während der Rest Europas mit Regen, Schnee und kalten Temperaturen zu kämpfen hat, blühen die Kanaren auf und man spürt schon die Vorfreude auf den Sommer. Es ist Frühlingsbeginn und überall auf den Inseln findet man frische, grüne Blätter und schöne farbenfrohe Blumen. Es ist der perfekte Zeitraum für Wanderungen in den wunderschönen Naturparks der Inseln, um sich am Strand zu entspannen oder einfach nur das frische Gefühl des Frühlings zu genießen. Und wo kann man den Frühling auf den Kanarischen Inseln am Besten genießen? Wir haben drei unserer neuen Ferienhäuser ausgewählt, die sehr unterschiedlich sind, aber auch etwas Entscheidendes gemeinsam haben: die drei bieten atemberaubende Ausblicke, so dass Sie die schöne Frühlingslandschaft mit allen Sinnen genießen können. Es esa época del año otra vez: mientras que el resto de Europa está teniendo dificultades con la lluvia, la nieve y las bajas temperaturas, las Islas Canarias están floreciendo, empieza la primavera y ya se puede sentir la emoción por el verano. En esta época del año, encontrarás en todas partes hojas verdes frescas y flores de colores impresionantes. Es el momento perfecto para caminatas en los hermosos parques naturales de las islas, disfrutar del clima cálido en la playa y, en general, simplemente disfrutar de la sensación fresca de la primavera. ¿Y cuál es el mejor lugar para disfrutar de la primavera en las Islas Canarias? Hemos seleccionado tres casas nuevas, que son muy diferentes, pero al mismo tiempo comparten algo muy importante: las tres ofrecen vistas impresionantes para que puedas disfrutar del hermoso paisaje de primavera con todos los sentidos. At Casa Vista Caldera (i.e. House Views of the Valley) the name is program. 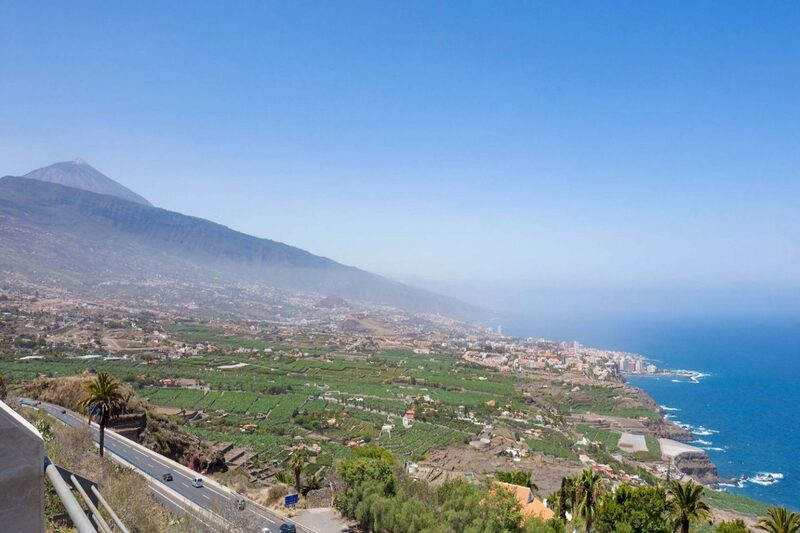 This charming house is located in a valley next to the beautiful coastal town of Tazacorte in the area of La Palma with the most sunshine hours per year. The casa is surrounded by banana trees and offers the most stunning views of the surrounding mountains in the north and the green valley that leads to the sea and the stunning black sand beach of Tazacorte (one of the most popular beaches of the island). Other highlights of this holiday home are the lovely outdoor area with many possibilities to sit and relax, the private pool for a refreshing dip and the pink bougainvilleas that give the house that special touch. 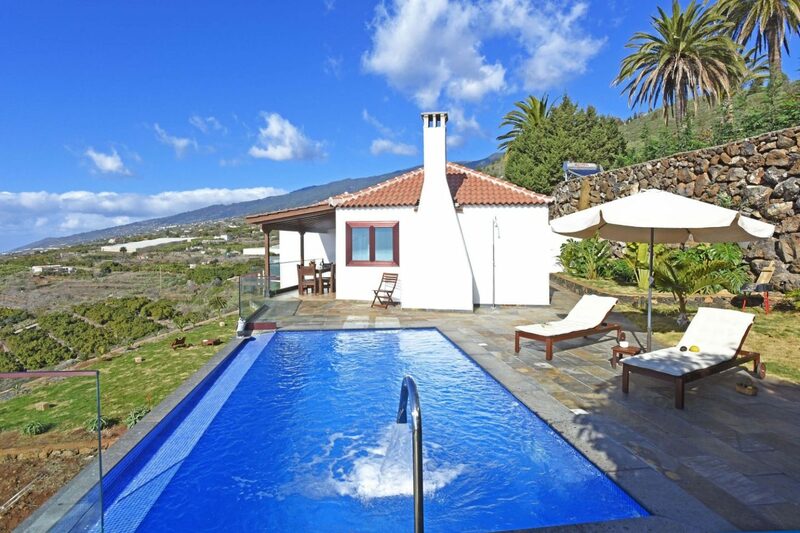 Another recent addition on La Palma is Casa Vista Mar (yes, you guessed it: House Views of the Sea) – a truly stunning villa with private pool located in Tijarafe, also in the sunny west of the island. Come to La Palma to enjoy nature at its best: go hiking in the famous natural park Caldera de Taburiente, visit the volcano Teneguía and the surrounding lava landscapes, go on a boat trip to watch dolphins and whales and see the almond trees in full bloom. Bei Casa Vista Caldera (Haus mit Blick auf das Tal) ist der Name Programm. 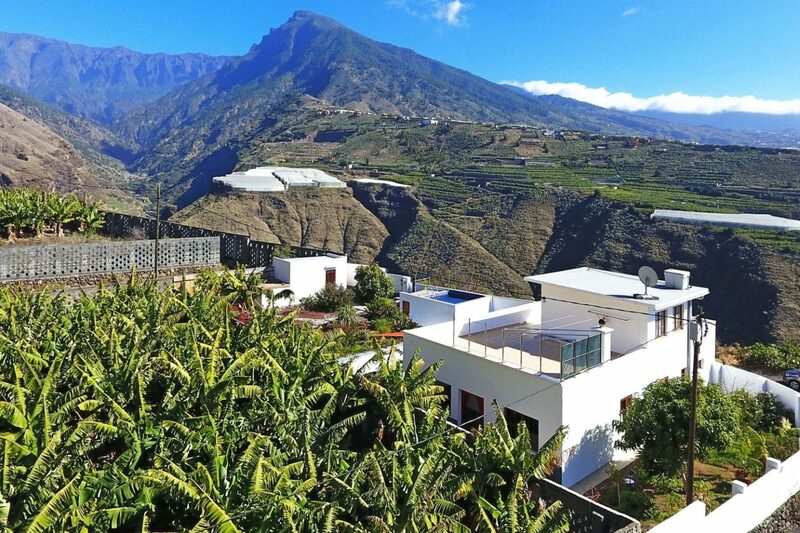 Dieses charmante Haus liegt in einem Tal in der Nähe des schönen Küstenortes Tazacorte, die Gegend von La Palma mit den meisten Sonnenstunden pro Jahr. Die Casa ist von Bananenstauden umgeben und bietet einen atemberaubenden Blick auf die umliegenden Berge im Norden und das grüne Tal, das zum Meer und zum schönen schwarzen Sandstrand von Tazacorte (einen der beliebtesten Strände der Insel) führt. Weitere Highlights sind der schöne Außenbereich mit vielen Sitz- und Entspannungsmöglichkeiten, der private Pool für ein erfrischendes Bad und die rosa Bougainvilleas, die dem Haus eine besondere Note verleihen. Ein weiteres neues Objekt auf La Palma ist Casa Vista Mar (ja, Sie haben es erraten: Haus mit Meerblick) – eine wirklich beeindruckende Villa mit privatem Pool in Tijarafe, auch im sonnigen Westen der Insel. Kommen Sie nach La Palma um die Natur im bestmöglichen Zeitpunkt zu genießen: gehen Sie im berühmten Naturpark Caldera de Taburiente wandern und bewundern Sie die blühenden Mandelbäume, besuchen Sie den Vulkan Teneguía und die umliegenden Lavalandschaften und machen Sie eine Bootsfahrt, um Delfine und Wale zu beobachten. En Casa Vista Caldera el nombre es programa. Esta encantadora casa se encuentra en un valle junto al hermoso pueblo costero de Tazacorte en la zona de La Palma con la mayor cantidad de horas de sol al año. La casa está rodeada de plataneras y ofrece unas vistas impresionantes a las montañas en el norte y el valle verde, que conduce al mar y la impresionante playa de arena negra de Tazacorte (una de las playas más populares de la isla). También hay que destacar la encantadora zona al aire libre con muchas posibilidades para sentarse y relajarse, la piscina privada para darse un chapuzón refrescante y las buganvillas rosadas que le dan a la casa un toque especial. Otra adición reciente en La Palma es Casa Vista Mar – una villa verdaderamente impresionante con piscina privada ubicada en Tijarafe, también en el soleado oeste de la isla. Ven a La Palma para disfrutar de la naturaleza en su mejor momento: haz senderismo en el famoso parque natural de Caldera de Taburiente, disfruta de los hermosos almendros en flor, visita el volcán Teneguía y los paisajes de lava circundantes y observa delfines y ballenas al hacer una excursión en barco. Villa Los Corales combines two things that will win you over in combination: modern architecture and breathtaking views of the highest mountain of Spain: Mount Teide with 3.718 meters. The cool villa with its big glass windows, bright interiors, private pool and edgy colourful details is the destination for everyone who wants a bit of style during vacations on Tenerife. Villa Los Corales is conveniently located in a residential area near the coast in the north of the island: the perfect home to retreat to after a busy day exploring the island. Tenerife during Spring is at its best: visit the many natural parks of the island for hiking and stunning views, take the cable car to the top of Mountain Teide, visit the lovely student city of La Laguna, check out the cosmopolitan capital city Santa Cruz de Tenerife for shopping and culture, get lost in a little Canarian town, excite your children with a visit to the near zoo Loro Parque or drive to the south for the best beaches of the island. Villa Los Corales bietet nich nur moderne Architektur, sondern auch einen atemberaubenden Ausblick auf den höchsten Berg Spaniens: den Teide mit 3.718 Metern. Die coole Villa mit ihren großen Glasfenstern, hellen Innenräumen, Privatpool und farbenfrohen Details ist ein Ziel für all jene, die eine stilvolle Unterkunft für ihren Urlaub auf Teneriffa suchen. Villa Los Corales befindet sich in einer Wohngegend in Küstennähe im Norden der Insel: der perfekte Rückzugsort um sich nach einem ereignisreichen Urlaubstag zu entspannen. Im Frühling zeigt sich Teneriffa von seiner schönsten Seite: besuchen Sie die vielen Naturparks der Insel zum Wandern und um die schöne Landschaft zu genießen, nehmen Sie die Seilbahn zum Gipfel des Teide, besuchen Sie die schöne Studentenstadt La Laguna und die kosmopolitische Hauptstadt Santa Cruz de Tenerife für Shopping und Kultur, verirren Sie sich in einem kleinen kanarischen Dorf, begeistern Sie Ihre Kinder mit einem Besuch im nahe gelegenen Zoo Loro Parque oder fahren Sie in den Süden um die besten Strände der Insel unsicher zu machen. Villa Los Corales combina dos cosas que te convencerán en combinación: arquitectura moderna y vistas impresionantes a la montaña más alta de España: el Teide con 3.718 metros. La estilosa villa con sus grandes ventanas de vidrio, interiores luminosos, piscina privada y detalles coloridos es el destino perfecto para todos aquellos que quieran un poco de estilo durante sus vacaciones en Tenerife. Villa Los Corales está convenientemente ubicada en una zona residencial cerca de la costa en el norte de la isla: perfecto para descansar después de pasar el día explorando la isla. Durante la primavera Tenerife está en su mejor momento: visita los numerosos parques naturales de la isla para practicar senderismo y disfrutar de vistas impresionantes, toma el teleférico hasta la cima del Teide, visita la hermosa ciudad estudiantil de La Laguna y la capital cosmopolita de Santa Cruz de Tenerife para shopping y cultura, piérdete en un pequeño pueblo canario, emociona a tus hijos con una visita al cercano zoológico de Loro Parque o disfruta de las mejores playas en el sur de la isla. 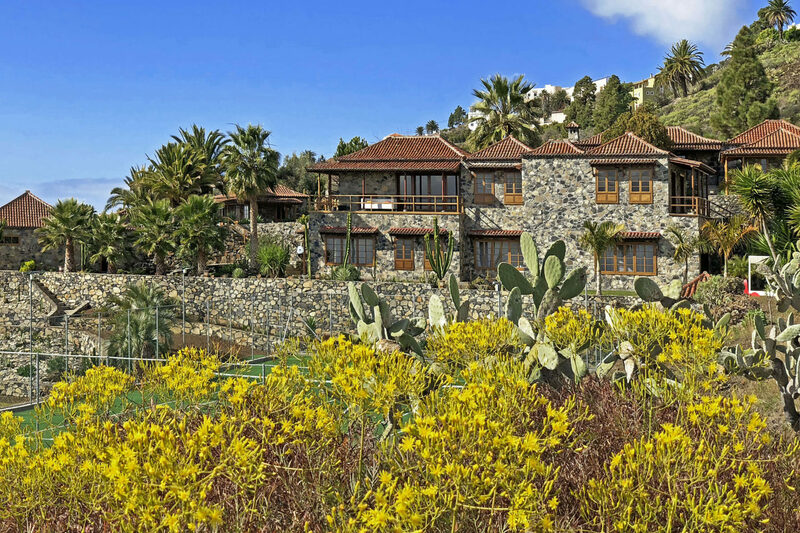 Our last tip is Villa Los Lagos 27, our latest addition in the Salobre Golf Resort on Gran Canaria. We’ve been fans of this golf resort for many years now as it combines the best of two worlds: the green golf course landscape and the stunning golden sand beaches of the otherwise dry and sunny environment of the south of Gran Canaria. Even if you are not a golf enthusiast, you will love the green hills of the 18 hole golf course Salobre South and the beautifulf resort that surrounds it. Villa Los Lagos 27 is beautifully located in the resort: cozy up in one of the chairs on the terrace and enjoy a good book while overlooking the golf course. The villa with modern interiors also offers a private pool and – if you want to have a bigger one – you can enjoy a swim in the community pool of the complex. Come to the Salobre golf resort to enjoy relaxing holidays in one of the best areas of the island: visit the best beaches of the island at a distance of 15 car minutes, discover the dunes of Maspalomas, the beautiful town of Mogán known as the Venice of the south and take a trip to the north of the island to do shopping in the capital city of Las Palmas and explore the green north of the island with its lovely towns. 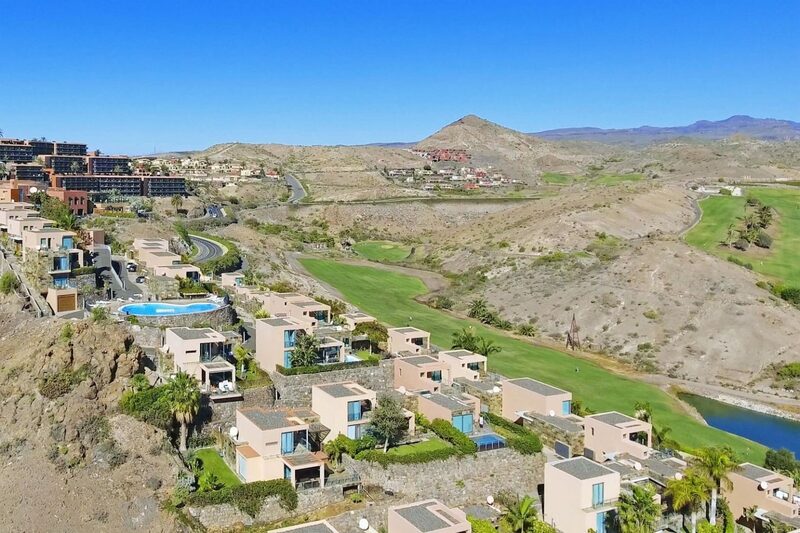 Unser letzter Tipp ist die Villa Los Lagos 27, unsere neueste Ergänzung im Salobre Golf Resort auf Gran Canaria. Wir sind seit vielen Jahren Fans dieses Golfresorts, da es das Beste aus zwei Welten vereint: die grüne Golfplatzlandschaft und die atemberaubenden goldenen Sandstrände des ansonsten trockenen und sonnigen Südens von Gran Canaria. Auch wenn Sie kein begeisterter Golfspieler sind, werden Sie die grünen Hügel des 18-Loch-Golfplatzes Salobre Süd und das wunderschöne Resort lieben. Villa Los Lagos 27 bietet aufgrund seiner etwas erhöhten Lage einen wundervollen Ausblick: machen Sie es sich mit einem Buch auf der Terrasse gemütlich und genießen Sie den Blick auf den Golfplatz. Die Villa mit modernem Design bietet auch einen Privatpool und – wenn Sie noch längere Bahnen schwimmen möchten – haben Sie auch noch den Gemeinschaftspool des Komplexes. Kommen Sie in das Salobre Golf Resort um einen erholsamen Urlaub in einer der besten Gegenden der Insel zu genießen: besuchen Sie die besten Strände der Insel innerhalb von 15 Autominuten, entdecken Sie die Dünen von Maspalomas, die wunderschöne Stadt Mogán, bekannt als Venedig des Südens und machen Sie einen Ausflug in den Norden der Insel um in der Hauptstadt Las Palmas das Kultur- und Einkaufsangebot, sowie den grünen Norden der Insel mit seinen schönen Dörfern zu erkunden. Nuestro último consejo es Villa Los Lagos 27, recientemente incorporada a nuestra oferta en el Salobre Golf Resort en Gran Canaria. Hemos sido fans de este complejo desde hace muchos años, ya que combina lo mejor de dos mundos: el paisaje verde del campo de golf y las impresionantes playas de arena dorada del árido y soleado sur de Gran Canaria. Incluso si no eres un entusiasta del golf, te encantarán las verdes colinas del campo de golf de 18 hoyos Salobre Sur y el hermoso complejo que lo rodea. Villa Los Lagos 27 tiene una ubicación un poco elevada, perfecta para disfrutar de unas vistas inmejorables desde los cómodos sillones en la terraza. La villa con interiores modernos también ofrece una piscina privada y, si quieres tener más espacio, también puedes disfrutar de la piscina comunitaria del complejo. Ven al Salobre Golf Resort para disfrutar de unas relajantes vacaciones en una de las mejores zonas de la isla: visita las mejores playas de la isla a una distancia de 15 minutos en coche, descubre las dunas de Maspalomas, la hermosa ciudad de Mogán conocida como la Venecia del sur y haz una excursión al norte de la isla para ir de compras en Las Palmas, la capital de la isla, y explorar el verde norte de la isla con sus encantadores pueblos. YOU WANT MORE STUNNING VIEWS? We know that you can’t have enough of stunning views… But there’s a solution to that: check out our new video of Finca Lomo Felipe. The stunning property with private pool and tennis court is an all-time favorite of ours to enjoy the most luxurious and comfortable holidays ever on the Canary Islands! Wir wissen, dass Sie nicht genug von atemberaubenden Aussichten haben können… Aber dafür gibt es eine Lösung: schauen Sie sich unser neues Video von Finca Lomo Felipe an. Die schöne Finca mit Privatpool und Tennisplatz ist eine unserer all-time favorites, perfekt um den luxuriösesten und komfortabelsten Urlaub aller Zeiten auf den Kanarischen Inseln zu genießen! Sabemos que quieres más vistas impresionantes… Pero hay una solución para eso: nuestro nuevo video de Finca Lomo Felipe. La impresionante propiedad con piscina privada y cancha de tenis es uno de nuestros all-time favorites, perfecta para disfrutar de unas vacaciones lujosas y confortables en las Islas Canarias. Cruising over the waters of the Atlantic Ocean near Gran Canaria. © 2017 LasCasasCanarias Travel Blog | All rights reserved.